Open Feature request MC-87 Nothing entered. I do not like the current 'candlestick' implementation because the wick cannot be the same colour as the body of the bar. I like hollow candlesticks because the wick has the same colour as the body of the bar. Unfortunately, in hollow candlesticks one cannot have both the up bars and down bars filled. 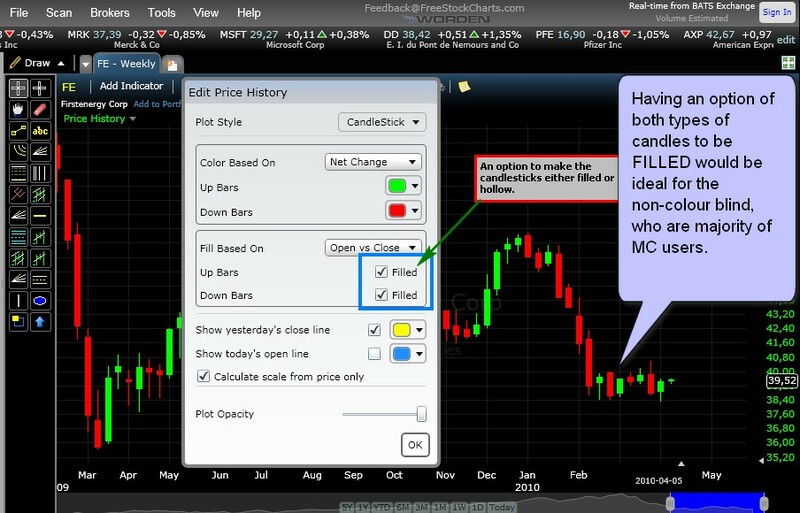 The current implementation of hollow candlesticks is extreemely good for the colour blind - please see picture 'Current holow candlesticks' picture. The solution for the non-colour blind is presented in picture 'Proposed FILLED candlesticks'. Depending on a trader's preferences one could have both types of candles either (i) filled or (ii) hollow. Alternatively (if easier to implement), standard candlesticks might have an option to display Wick the same colour as the candlestick's body. '''Tresor wrote:''' >Alternatively (if easier to implement), standard candlesticks might have an > option to display Wick the same colour as the candlestick's body. It should paint the bars the way you want it. Please apply the following PaintBar study to your chart: [http://dl.dropbox.com/u/26968921/PaintBar.pla](http://dl.dropbox.com/u/26968921/PaintBar.pla) It should paint the bars the way you want it. '''Dave wrote:''' >Please apply the following PaintBar study to your chart: > [http://dl.dropbox.com/u/26968921/PaintBar.pla](http://dl.dropbox.com/u/26968921/PaintBar.pla) > > It should paint the bars the way you want it. '''Dave wrote:''' >This issue is targeted for **MultiCharts 7.0 Release (RELEASED)**. Dave, we do not need a paint bar study. We need this feature natively implemented in MC. '''Tresor wrote:''' >Dave, we do not need a paint bar study. We need this feature natively > implemented in MC.